This guest blog is by ELGL member Stephanie Chase, the director of the Hillsboro Public Library in Hillsboro, Oregon. 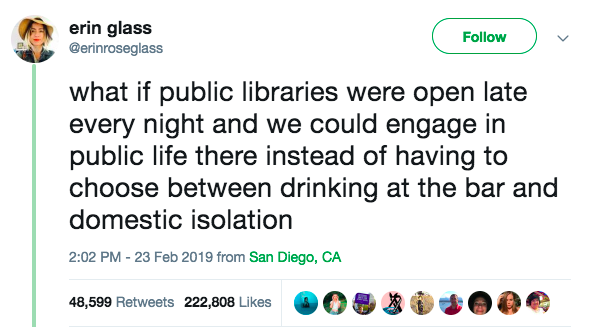 Basically: to talk about all the reasons public libraries couldn’t do this, instead of why we could, with a hefty dash of throwing the ideas of a user under the bus. It’s simply not acceptable to respond to our public in this way, and it’s not good for the future of local government services, either. Of course our communities want longer hours for our services, and of course, any extension or expansion of service needs to have a review of resources. Adding another entire work shift to keep public spaces open late (or, say, open the library at 6am for storytimes and coffee klatches for seniors, or the City’s permitting desk at that same time to match construction work schedules) without additional funding is only one way to respond, and not the most sustainable way. But for us to attack a community member for an idea for service? To belittle them because that idea didn’t come with a full (and executed) funding plan? That’s a true shame. As an innovator, I believe the only way we can get better is by thinking about what’s possible, instead of what’s impossible. Brainstorming methods ask us to create first, and analyze second; we can solve problems by changing our perspective. At the Hillsboro (OR) Public Library, one of the methods we like best for reframing our thinking is the “Beautiful Constraint” method of Mark Barden and Adam Morgan of marketing consultancy eatbigfish. 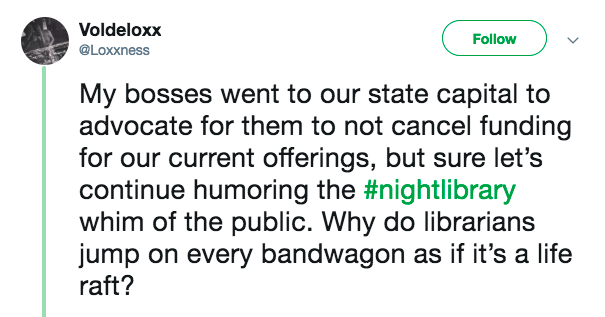 How can we provide Night Library service (keep the public library open until 11pm) without adding additional staff, and without negatively impacting existing staff and services? We can provide Night Library service if we resource it by asking current staff if they would like to work a night shift, instead of assuming we have staff who would not want to. We can provide Night Library service if we substitute night hours on Fridays for morning hours on Fridays. We can provide Night Library service if we fund it through private-public partnership. We can provide Night Library service if we think of it as self-service time for users and have fewer library staff. This method is a great way to take the first step of transforming something that seems impossible into a challenge to see whether we can make it possible. What if instead of thinking a public library (or local government) can only do so much, we instead considered that the possibilities can be endless, with the right resources (funding, partnerships, volunteerism, community engagement, grants and donations, and so on)? Every potential new idea is an opportunity to reflect on whether our own definition of service and purpose needs to be reconsidered or redefined in light of community input. It is our responsibility to figure out whether an idea floated by a community member and user of our local government services is or would be a priority in our community, and then seek, even if it is long-term, to make those priorities reality.